Day four of my seven favourite nature-related books of 2012. If you've missed the first three, you can catch up with them here (day 1; day 2; day 3). Each book is presented alongside a 'perfect partner', so please scroll right down the page to read both. And since you'll be thinking about Christmas presents, don't forget that you can order a copy of my colourful British Wildlife calendar here. Are you completely mad?! (Probably). Shakespeare?!? (Please, call me Kris). I thought you said all these books were published in 2012! And you said they were all nature related! While Shakespeare’s play may be a classic of 17th century drama, this Norton edition is new as of 2012. I’m a big fan of Norton books, which reproduce not only a classic literary text with a wealth of interesting annotations, but also provide an additional anthology of literature, historical and modern to set a context for the main work, all in one volume. And I’ve spent much of this year with my nose in this book. Shakespeare’s play is a classic of Pastoral literature (although the debate still rages as to whether he was composing true pastoral, or merely parodying the style as anti-pastoral), asking many questions about the interaction between man and the natural world; is life in a civilised society in the city (or in the court) really an improvement over the simple life lived foraging in the woods; does man have the right to leave the city and trespass upon the home of wild animals, killing them for food? Do animals have consciousness that makes them prone to suffering in a way we humans might understand. Shakespeare balances the dialogues so skilfully that the play provides a debating ground for the characters (and audience) without ever settling the debates one way or the other. 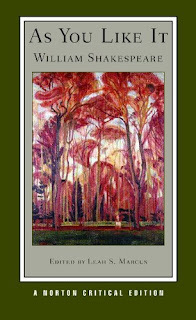 Meanwhile, this book also presents a great many additional articles and chapters for the modern reader to consider on the subject of man’s relationship with nature. Alongside the play, the editor has reproduced a wide range of historical and modern articles which set the context for the debate and show its continuation into the modern age. Thomas Lodge’s prose romance Rosalynde, on which Shakespeare based his play, is printed here and can be read alongside the play, but there is much else to deepen the readers involvement in the debates. Among the highlights for me are George Gascoygne’s poem of 1611, ‘The Woeful Words of the Hart to the Hunter’, a four-page anthropomorphic plea (in the words of a deer) which appeals to the hunter for understanding of the pain and suffering of hunted beasts and Montaigne’s classic text on the place of humans in relation to animals (‘When I am playing with my cat, who knows whether she have more sport in dallying with me than I have in gaming with her’). More modern extracts include those by Keith Thomas on ‘Boundaries between Animal and Human’ (taken from his great book Man and the Natural World: Changing Attitudes in England 1500-1800, a brilliant book worth a read in full), and Gabriel Egan’s essay ‘Food and Biological nature in As You Like It’, from Green Shakespeare: from Ecopolitics to Ecocriticism. There are plenty more. For those readers interested in the historical considerations of man’s place in nature, his relationship with animals, and the nature (and unnaturalness) of civilisation, this is an enlightening anthology that will have pride of place on the shelf to be brought down for many readings. Those wanting to get their fill of Shakespeare this Christmas won’t be surprised to learn that I considered making Shakespeare’s The Winter’s Tale the (somewhat predictable) partner of As You Like It. Nevertheless, Norton has not yet published an ‘anthologised’ edition of the play (although the Arden Shakespeare edition does contain useful discussions of ‘Pastorals’ and ‘Nature and Art’ within the lengthy introduction which I recommend for general interest). 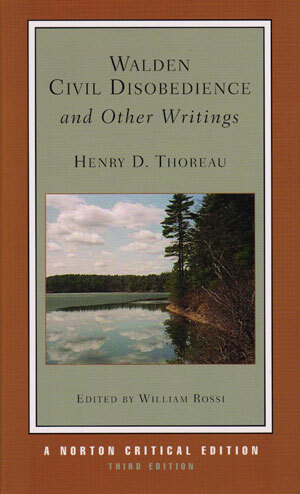 Nevertheless, the chosen partner today is Norton’s edition of Henry David Thoreau’s classic Walden, an account of the author’s experiment over the course of three years to live a life in an area of Massachusetts woodland in the 1840s. Alongside Thoreau’s great rumination on the burdens of 19th civilised life, this volume also contains his personal journal from the Walden years, as well as many other great texts, including ‘Walking’, ‘Wild Apples’, and ‘Civil Disobedience’. At almost 700 pages, this is quite a sizable volume for discovering Thoreau for the first time, and much as I love it, I still seek refuge in my well-thumbed Oxford edition of Walden (no extras here, except for the editor's introduction and some very good endnotes), a much more portable volume for general reading and travelling with (my copy also happens to contain several years’ worth of my own loving annotations and underlinings which make it irreplaceable, and of the several copies I own, is still the first edition I turn to for Walden itself).